Hello everyone: The RETRO RUBBER challenge has a fun and versatile sketch for you to play with so we hope you find a bit of time to come and join my teammates and me in our gallery. Here is my card, for more inspiration, stop by the blog and check out the rest of the team's creations. This cute line of Tea Pots is from a super old 1996 Stampin' Up! set called "Best Borders" and it has 4 borders with the cutest images, besides this one, there is a Snow Man border, a Bird House border and a Garden border, all sweet and adorable. I stamped the image on watercolor paper with Stazon black ink and colored it with SU markers and Prismacolor Pencils. The lacy border is from a Martha Stewart punch and the pattern paper from a retired line from Lili of the Valley. The sentiment is from a Power Poppy set called SHORT STACKS. The sentiment is from the "Short Stacks" set, the little teapots from the "Best Borders" set. I hope you visit the RETRO RUBBER challenge blog to check the rest of the Designer Team's beautiful creations and get ready to play along with us. 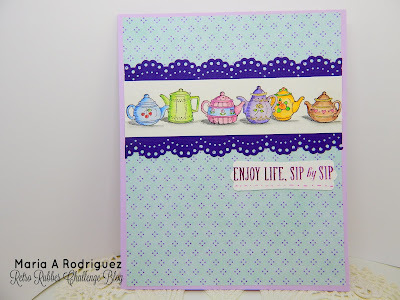 Such a sweet card and I really love those teapots! The stamp set sounds adorable and useful for many types of cards. Your coloring is cheerful so anyone would love receiving it, Maria! Hope you are enjoying our HOT summer! Oh, gosh, I love the tea pots and your card! I've got a tea pot card all made up and waiting to be photographed, but no time as we're heading out on another vacation trip. I even used this sentiment. Love this, Maria! 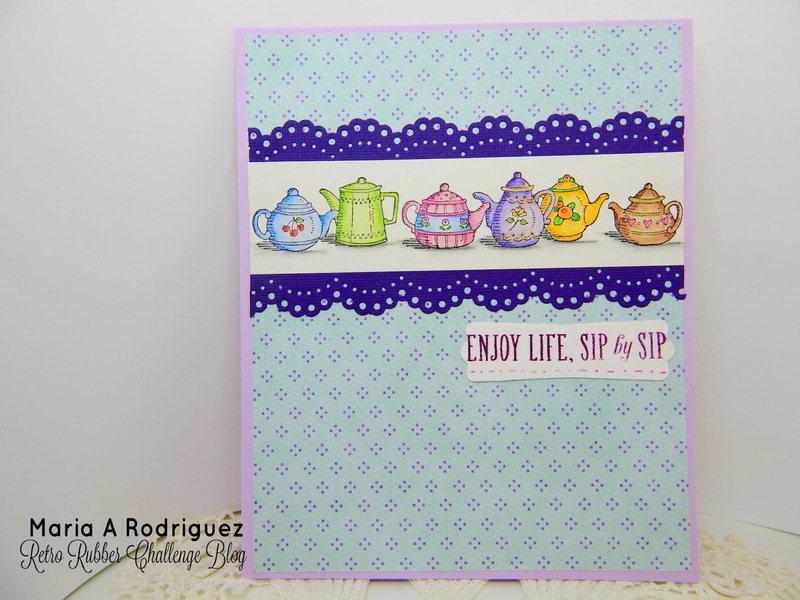 Maria, love the teapots and the layout of your card. The way your colored them is outstanding and I love the sentiments. Your little teapots are so cute ! Love the sentiment inside ! What a super line of teapots! I'm always amazed at the depth of colour you get from your pencils, Maria. The lacy border really enhances the colours in them.